NEGROS ISLAND, Phillipines, - A human rights lawyer, who provided assistance to families of recently slain sugarcane farmers, was shot dead in central Philippines, becoming the 34th member of the legal profession killed since President Rodrigo Duterte came to power in 2016. 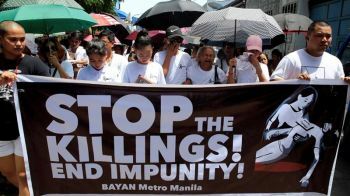 The National Union of Peoples' Lawyers (NUPL) on Wednesday denounced the killing of Benjamin Ramos, the group's local leader, who was killed by unidentified motorcycle-riding assailants on Tuesday evening on the island of Negros. Reports said he was hit three times in the back and upper chest. "We condemn in the strongest possible terms the cold-blooded murder of Attorney Ramos," NUPL assistant secretary general Josalee Deinla told Al Jazeera. Ramos, 56, was the 24th practising lawyer killed in work-related attacks in the country since August 2016, according to a list compiled by NUPL. The list also includes three judges and seven prosecutors, bringing the total number of legal professionals killed to at least 34 in the last two years. Most of the reported deaths have not yet been solved. On September 29, a lawyer, who handled drug-related cases in the northern city of Laoag, was shot twice in the back but survived. Five days earlier, a female lawyer was killed by gunmen in the southern city of Tagum near Duterte's hometown of Davao City. Duterte was took oath of the top office in June 2016. Soon after, he compiled a list of politicians, judges and police officers, whom he accused of having drug links. He has also carried out a deadly anti-drug war that reportedly killed more than 20,000, a number that the government and police dispute. Recently, the president also railed against left-leaning political groups and threatened to kill communist leaders after peace talks with the government collapsed. In February, he offered a bounty for every rebel fighter killed.